For anyone who has worked with me organizing content-driven events, you will have heard me say regularly how much I hate panels. I am quick to declare my dislike of them, but generally only in the safety of a group of organizers. I’ll try to provide some clarity in the need for panels, why I dislike most panels I see, and what we can change to make them better. In theory, I understand the appeal of panels. There is a lot of information available in the world, and it’s increasingly difficult to assess how trustworthy to consider the opinion of any self-proclaimed expert. There are many ways to achieve expert level opinions: by education, by research, by practice. Probably other ways, too. To solve the problem, we host panels. We gather industry thought leaders or experts and have them discuss things openly, in the accountability-forging context of “filming in front of a live audience”. We then leave it up to the audience to decide — what is your version of this truth that we’ve presented to you, almost without editorial aid? In practice, panels are far from that. They are either overpowered by a single voice or are overpowered by apparent fighting among the panelists. Moderators double as panelists and leave the group with no discernible direction. Panelists answer in a round robin style, often leaving no time for interesting or informed viewpoints to shine through. Panels are overstaffed and used as a way to prevent the discomfort of having to turn down speakers. Most people don’t apply to be on a panel, and many who get assigned to participate on a panel think that it means no preparation is required. It’s not that we’ve never seen a good panel. We see them from time to time, on TV or at large-scale niche events. There is a lot of writing available about how to be a better speaker, but not a lot about how to be a better panelist. Or even how to craft an excellent panel as an organizer. So I’ll tell you what’s proven to work for me over the years, as a long-time event organizer. In my experience, the best panels require a thoughtful moderator and panelists with a decent level of rapport (but not best friends). It’s great if you already have a group that fits that description. If you don’t there is a short, simple process that you can follow to foster one from the expert panel you have assembled. Dedicated Moderator – Find your moderator first, because you’ll need them throughout this process. The best moderators keep the discussion moving by helping with time management, directing questions toward particular panelists, and resisting the urge to join the discussion. Limited Number – If the time allowed for your panel is one hour, you should select no more than three panelists not including the moderator. That gives each speaker about 15-20 accumulated minutes assuming everything else is perfect. Prepare Panelists – Your moderator and panelists should have two meetings. Each meeting should take about an hour and be via voice (or a video call if you feel fancy). In the first one, do some general introductions and learn about everyone’s expertise as it relates to your broad topic. The moderator should take notes* and the panelists should explore what they are all excited about so that a topic can be defined. Clarify Your Topic – After the first meeting, the moderator will know what the most interesting areas of expertise each panelist has. That will help them guide questions (whether prepared or from the audience) to the right people. It will also help create a panel title that is clear, concise, and marketable. Written Questions – In the second meeting, the moderator should have some questions that have already generated interesting discussions among the panelists. Ask the panelists if, since their last meeting, they’ve been wondering about something another panelist said. Write down 5-10 questions and be prepared to start the panel on the day with 2-3 of them. This past weekend I headed south for a bit of quality community time in Fayetteville, Arkansas. The lovely folks there can teach a thing or two about WordPress just as easily as they teach you about hospitality. I didn’t take any pictures all weekend, so I have for you one picture of me with a banner and one picture of a merhog. 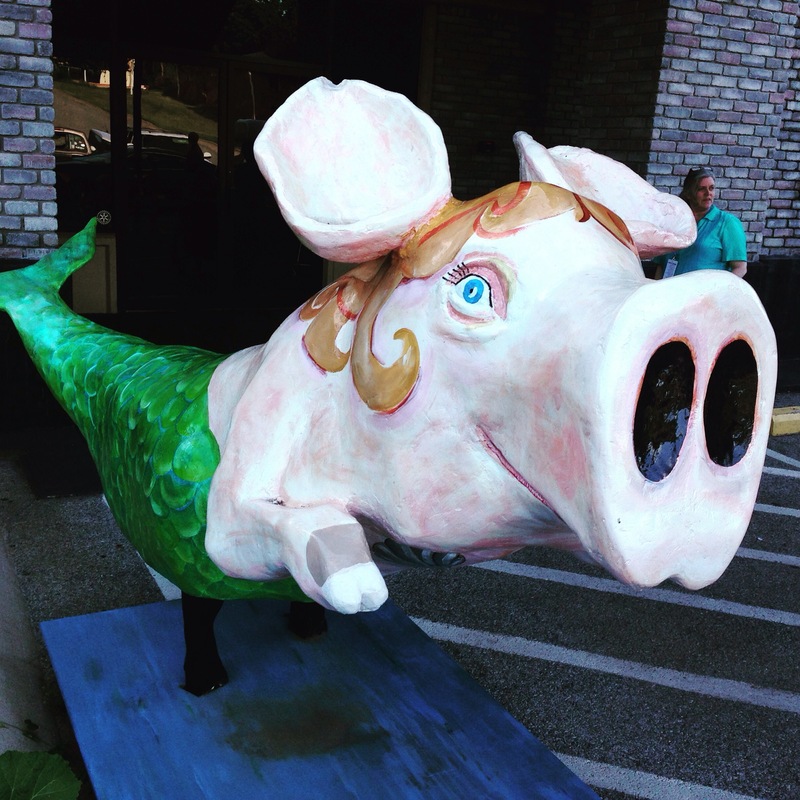 In case you are unsure of what a merhog is…it’s a hog with a fish tail. It is mythical. Honestly, it’s probably the myth of a myth, but here it is in all its glory regardless. A glorious myth’s myth. Day two of WordCamp is over and that means we’ve just got the one day left. Content and Contribution is the name of the game! I had planned to make this a collection of sites and sounds of Brisbane, but I could not for the life of me figure out how to record video on my camera. So, here we have a collection of photos from my trip and WordCamp Brisbane.